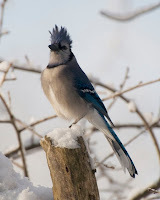 Nature Reporters: Snowy Presidents' day! For once, the meteorologists got it right! We woke up to about 1.5" of heavy, wet snow. It was so pretty, every twig was outlined in white. The trees looked especially pretty with the dark clouds in the background early in the morning. I wanted to get photos of holly berries in the snow, but when I looked at the bush on the side of the house, it had been stripped, not one berry remained. I guess the robins had a feast last week! Of course, I enjoyed watching the birds in the tree behind the house. I felt sorry for a little Downy Woodpecker. 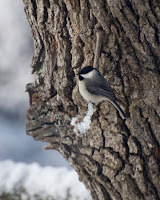 He had taken a peanut from the feeder and wedged it into a furrow of the tree bark. 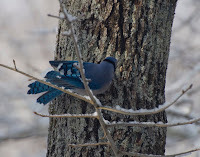 Just as he was getting ready to enjoy it, a Blue Jay flew up screaming in its raucous voice and drove the woodpecker away. It seemed t o really enjoy its ill-gotten meal (right)! He (or one of his relatives) did strike some nice poses on the tree so I could get some nice photos later. 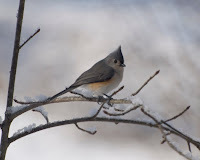 Some of the other birds I saw were Black-capped Chickadees (right), Tufted Titmice (left), Cardinals, Towhees, various sparrows, and a Goldfinch. It's a good thing I didn't have to teach today, I have had a sinus infection and laryngitis the past couple of days. That is no fun! I still bundled up and went out to try and photograph some snowflakes today. I didn't have much luck, either they were broken or the wind kept blowing them off before I could get any good shots. That was frustrating! Some snow days are better than others for photography. You got about as much snow as we did in those last 2 "huge" storms!! Today they are saying 2-10 inches--doesn't that leave it wide open for error?! !